Redesign… yeah you read it correctly. You give your first impression only with the website design. The audience comes on your website only if they find it attractive and responsive for browsing. It is not as tough as you think it is. Redesigning is not about changing every single graphic design element. It is just to modify functions to make website work in a better way and improve your business. If I am not wrong website is one of the core marketing strategies, right? It’s not possible to particularly define a single reason for redesigning of the website. There are enormous reasons of why you should go for redesigning. Suppose you have done everything to make your website look good but still customers are not getting converted after reaching your website. Then, your efforts are useless. Definitely, your website should be built for conversion of those customers who enter your website. 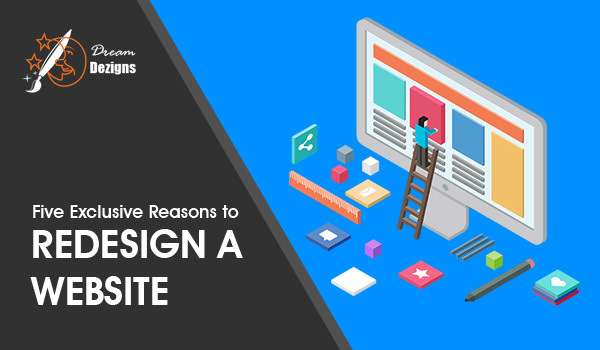 If it’s not happening then you must think about redesigning the website. There are certain things which need attention like call to action button, attractive landing page. Website Design should provide a clear view about what your company actually do. Nowadays, most people use mobile rather than desktop/computer for browsing websites. If your website is not user-friendly then it should be redesigned. Google marks responsive web design as one the ranking factor for the website. 52% mobile customers say that bad mobile experience causes less engagement on the website. Having a website for more than 4-5 years with same design gives a look and feel of outdated one. As you know website technology is changing rapidly, you should also work according to it. Visitors make an opinion about the website in less than a second, by seeing web design of company profile. If your website looks outdated, it needs to be redesigned. If people find difficult to navigate in pages or complete call to action, it creates a bad impression in user’s mind. If websites contain old coding that is not updated on regular basis, you should think of redesigning. Overall, you need to check for broken links and make regular updates in coding. It’s required to maintain the website periodically. It is one of the necessary factors that you need to be careful. Do you know that customers leave the website if it takes more 3 seconds for the website to load. If your site is having good loading speed then it will make users stay on your website for a long time.